The latest release from Van Morrison is really only for his true fans. It's enjoyable, but it doesn't seem as inspired as his last few albums. 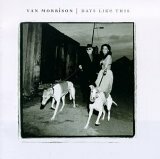 Morrison seems to be in a rut with a formulaic approach to songwriting, and only one of the tunes contained on Days Like This seems to really go anywhere. This one, Ancient Highway, is a dreamy tune that floats back to Morrison's classic album Astral Weeks. The short, made for a single, title track Days Like This is undoubtedly a rather infectious tune, but while No Religion and Underlying Depression are valiant efforts, they still don't come close to the masterpieces contained on Morrison's 1992 album Hymns to the Silence. Days Like This is available from Barnes & Noble.